I hope I'm not the only one who thought about this after I saw the movie x_x The tentacles coming out of the hair is essentially a thick rope of neural tissue that allows them to interface with multiple creatures of their planet, and even the planet itself. 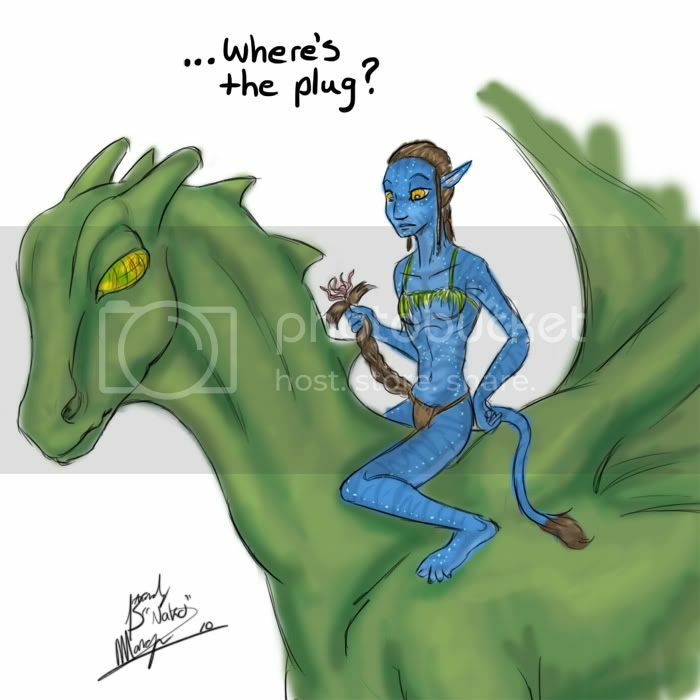 Needless to say, the Na'vi is a little confused when thrown onto a completely different world. Also, this is a very quickly done sketch that was then colored even quicker. It's just something fun that I wanted to start the new year with. Re: Avatar Meets Pern. Spoiler-ish? HAHAHA!!! I love this picture!! May have been quickly done, but its still very good. I like it. It is very good. I would like to see more of your work. I'm glad you all like it =D I have another piece I'm working on that I'm trying to take more seriously but I don't know how far I'll get with it. I'll be sure to post either the sketch or the finished piece depending on whether I actually finish it or not. My daughter can do it - she gave us the most awesome pencil drawing, from a photograph of me and my other half in 1974, as a Christmas gift. Lord alone knows who she inherited the talent from - the only useful thing either of her parents can do with a pencil is write a shopping list! Love the drawing, can't wait to drag said other half off to the pix when it gets to our neck of the backwoods. Last edited by Cheryl; Jan 3 2010 at 02:16 PM. Reason: No need to quote entirety of first post; it's presumed you are responding to it. I just found this thread (only 2 weeks late). What a great picture! You should be a cartoonist. Pern must be a more advanced version of Pandora: you start with a plug, then move on to bluetooth and WiFi and finally to telepathy.